Group of Plant Pattern Formation | Division of Biological Science, Graduate School of Science, Nagoya University. Plants, like animals, make use of both long-distance and local cell-cell signals to integrate their developmental patterning. Unlike animal cells, however, the plant cells are encapsulated by the rigid cell walls, as such developmental patterning in plants manifests in the absence of cell migration. We aim to unravel how plant cells interpret complex positional cues, interact with each other, and make cell-fate decisions to generate beautiful, orderly patterns. Plants form a critical base of our ecosystem. As such, the importance of plants for our life and sustenance of our civilization could never be understated. We strive to unravel the dynamic nature of plant pattern formation, and hope that our research will make innovative new directions in basic plant biology as well as a means for potential translation to agricultural sciences. As a member laboratory in the WPI Institute of Transformative Biomolecules (ITbM), we are actively collaborating with synthetic chemists and theoretical structural biologists to design new chemical compounds for probing, visualizing, and manipulating pattern formation. We also provide the international training opportunity for those students interested in research experience abroad. 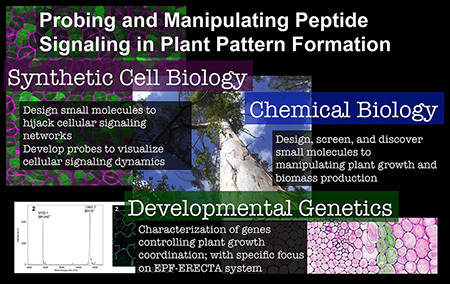 We have deciphered the conserved logic of peptide signal transduction pathways regulating multiple developmental processes in plants: EPIDERMAL PATTERNING FACTOR (EPF)-family peptides perceived by the same receptor, ERECTA, enforce proper stomatal development, promote stem growth, specify leaf shape and vascular patterning. To understand signal specificity, discrimination and buffering, we are categorizing the bioactivity of EPF/EPF-LIKE genes in vivo by taking advantage of their well-described roles in stomatal patterning and stem growth. We plan to collaborate with ITbM’s peptide synthesis group. Proper stomatal patterning and density influence plant productivity and survival. As such, identifying small chemicals that influence stem cell activities within stomatal cell lineages could be potentially useful for both basic cell and developmental biology and applied crop science. With the ITbM’s new Molecular Structure Center, we plan to initiate chemical screening. Plants use small chemicals to regulate development and environmental response. As collaboration with the ITbM’s chemists, structural biologists, and physiologists, we plan to reverse-engineer hormone receptors for plethora of synthetic analogs with interesting properties, produced at the ITbM. We expect that number of molecules and mechanisms regulating cell-cell communication in plant development are yet to be discovered. Therefore we always welcome any creative idea, hypothesis, or trial to explore novel mechanisms for cell-cell communication. 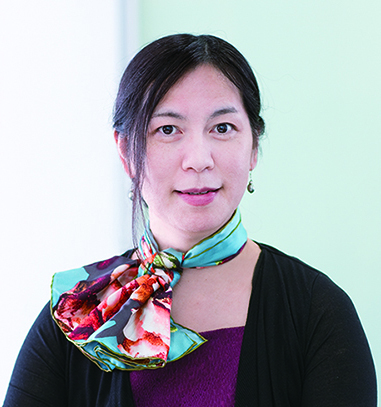 Hirakawa Y. et al. (2017) Cryptic bioactivity capacitated by synthetic hybrid plant peptides. Nature Commun., 8, 14318 (7 pages). Ikematsu S. et al. (2017) ERECTA-family receptor kinase genes redundantly prevent premature progression of secondary growth in the Arabidopsis hypocotyl. New Phytol., 213, 1697-1709. Tameshige T. et al. (2017) Stem development through vascular tissues: EPFL-ERECTA family signaling that bounces in and out of phloem. J. Exp. Bot., 68, 45-53. Nemhauser. et al. (2016) Plant synthetic biology for molecular engineering of signalling and development. Nature Plants, 2, 16010. Tameshige T. et al. (2016) A secreted peptide and its receptors shape the auxin response pattern and leaf margin morphogenesis. Curr. Biol., 26, 2478-2485. Lee J.S. et al. (2015) Competitive binding of antagonistic peptides fine-tunes stomatal patterning. Nature, 522, 439-443. Tameshige T. et al. (2015) Cell walls as a stage for intercellular communication regulating shoot meristem development. Front. Plant Sci.,6,324 (10 pages). Bemis S.M. et al. (2013) Regulation of floral patterning and organ identity by Arabidopsis ERECTA-family receptor kinase genes. J Exp Bot. 64:5323-33.